Who is your next customer? Conceptually – their hopes, needs, outlook, dreams etc. What is the story they told themselves BEFORE they met you? How do you create an encounter them in a way that they hear and trust the story you are telling? What changes are you trying to make in them, their life, their story? 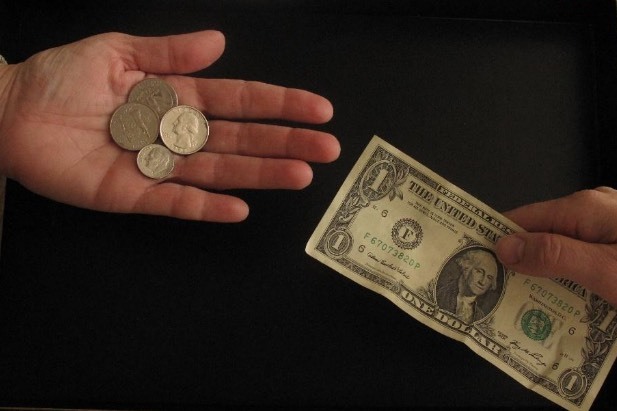 The homeless man identifies his customer by offering something they needed, quarters. The preconceived notion is that a homeless person is seeking a free hand out. This person offered something needed – 4 quarters for a dollar – it took the person needing the quarters by surprise changing his preconceived notion of how a homeless person is supposed to act. This exchange is a change of story in both directions. The preconceived notion of how a homeless person in supposed to act and the realization that there exists a preconceived story that may just not be accurate. What stories are you telling yourself? What stories would you like to hear?